Did You See What Bill Clinton Said? RUSH: Now, this is just plain weird. Just saw this link on the Drudge Report, and I clicked on it. It’s a story at the NTK Network, and it’s about Clinton’s interview with The NewsHour on PBS that aired last week. And apparently Bill Clinton — I can’t believe this hasn’t made news before today. Are you familiar with this? 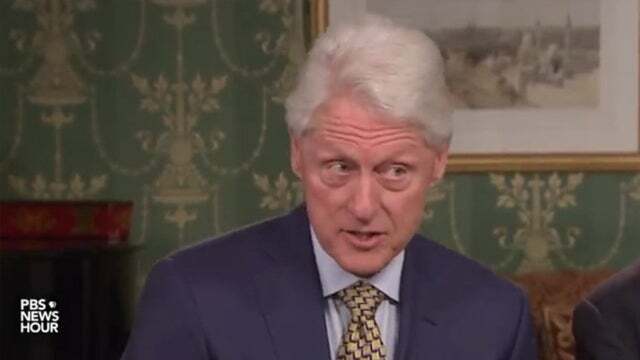 Bill Clinton: “The norms of what you can do to someone against their will have changed.” What? “The norms of what you can do to someone against their will have changed.” Meaning, you used to able to do a lot more to people against their will than you can get away with now? And then he started talking about how Al Franken got a raw deal. Smack-dab in the middle of the Weinstein #MeToo movement, and Clinton’s lamenting that you can’t get away with as much against their will on people as you used to be able to? This book tour is a disaster. I think now we know why Hillary didn’t want the guy showing up in the campaign.